MNP Poll: Who should be the new permanent anchor of 'Solar Nightly News'? While we can't wait to see what Nancy Irlanda will do next, we're as eager and curious as our readers to find out who will be her successor on Solar Nightly News. We heard there are two front-runners for the coveted anchor post, namely Hilary Isaac and Mitzi Borromeo. For our first MNP Poll this 2014, we are asking this question: Who should be the new permanent anchor of Solar Nightly News? 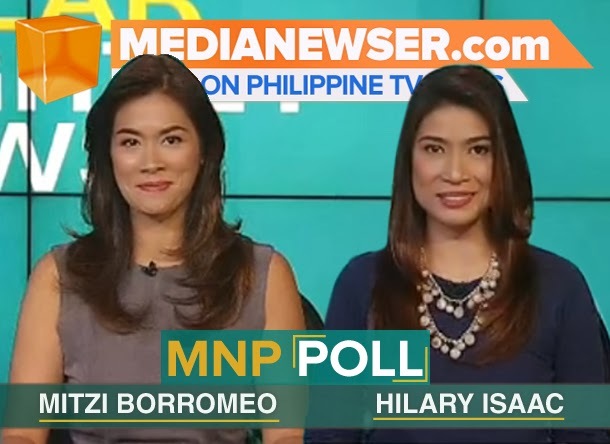 Do you prefer Headlines' Hilary Isaac or News Cafe host Ms. Mitzi Borromeo? There is nothing wrong with a little humor so we're adding Cesca Litton to the list of choices below. We have a lot of things to say about the changes on Nightly and what should be and what shouldn't be. Meantime, please make sure to vote in our poll and post your comments below on our Facebook page and Twitter account @medianewserphil. We'll have this poll open until the end of the month. Correction: We "shawned" (misspelled) the surname of Mitzi on our FB post last month.